This study, exploring how best we might treat children with Myalgic Enchephalitis [sic] or Chronic Fatigue Syndrome under the guidance of Dr Esther Crawley, Senior Lecturer/Consultant, Child and Adolescent Health sponsored by Bristol university and with the active participation of the association of Young People with ME (AYME) was reviewed on 8 July 2010 by the South West Research Ethics Committee (REC) as part of standard research regulation and ultimately received a favourable opinion on 8 September 2010. Subsequently the National Research Ethics Service (NRES) received a number of emails and letters about this study and, despite being satisfied with the ethical review, felt it fair to give consideration to the issues raised. It was clear that the application had received a considered and extensive review of the ethical issues of the project prior to the issue of the favourable opinion. This met all required procedures and processes, however, in view of the weight of correspondence received, much of which raised very similar issues, NRES asked the REC to consider the application, taking into account the issues that had been raised in the subsequent correspondence. Dr Hugh Davies, NRES Ethics Advisor provided a summary to the REC on the issues which had been raised and the opportunity was offered to Dr Crawley and the research sponsor to respond to the issues raised. In December 2010, the South West REC met again to consider the application and associated documentation. Dr Davies and Mrs Kirkbride attended the meeting to provide advice and support to the REC in relation to ethical matters and operational processes. Dr Crawley was also invited to attend the meeting and was accompanied by sponsor representative Professor David Gunnell. The Chief Executive of the Association of Young People with ME (AYME) had been due to attend to offer support but as a result of illness was unable to do so and sent in a letter of support. The REC considered all the information available to it and discussed the application and agreed a number of questions which they then put to Dr Crawley. After this interview and further consideration the REC agreed that they would uphold their initial decision to grant a favourable opinion to the research with one minor change to the patient information documentation and one suggestion for the future should the research progress beyond a feasibility study. Given the uncertainties of treatment of this condition and the need to resolve these, in line with professional guidance and duties, the REC felt this project would be a valuable start. A copy of the minutes of the meeting are attached and provide full detail of the discussions and agreements reached. I would like to thank you for your time in raising with NRES your concerns about the study. NRES believes that the initial application received a thorough review and an extensive reconsideration of the application at the December meeting and that it has fulfilled all its duties in the ethical review of the application. Extract of Minutes from South West 2 REC meeting held on 2 December 2010. Assessing the feasibility and acceptability of comparing the Lightning Process with specialist medical care for Chronic Fatigue Syndrome or Myalgic Encephalopathy (CFS/ME) – pilot Randomized Controlled Trial. Joan Kirkbride, NRES Head of Operations advised that the REC had previously given this study a favourable opinion to this study. Following this, NRES had dealt with a number of requests under the Freedom of Information Act from people and organisations who had raised a number of objections about the study. In view of this correspondence NRES asked the REC to debate these representations. Her attendance and that of Dr Hugh Davies, NRES Ethics Advisor at today’s meeting was to provide the REC with any guidance they may require in relation to process and ethical considerations. To facilitate this review, Dr Davies, had put together a paper which included a collection of representations made on this study. The points raised by the representations were distilled into 15 issues that the Committee discussed in turn. Permission had been sought from people who had sent correspondence to NRES to forward this information to Dr Crawley. Dr Crawley had provided a detailed response, which included letters from Mary-Jane Willows, CEO of Association for Young people with ME (AYME) and Colin Barton, Chairmen [sic] of the Sussex and Kent ME/CFS Society which the REC had available for consideration. 1. The study is misnamed and should be seen as more than a pilot study. The Committee reviewed what data was available comparing the effectiveness of different treatments. This data seems to indicate that the Lightning Process is as effective/ineffective as many other current treatments and that more research is needed to resolve these uncertainties for the benefit of ME patients. The Committee noted the correspondence submitted by Dr Crawley from Mr Parker refuting this. The Committee considered this. No evidence has been provided that Mr Parker has specifically used this study to increase sales. It was noted that the adjudication by the Advertising Standards Authority (ASA) had stated that “The ad [16 June 2010 Internet sponsored search] must not appear again in its current form. We [the ASA] told Withinspiration to ensure they held substantiation before making similar efficacy claims for the lightning process” and that all Lightning Practitioners had been advised of this. The protocol and application clearly state that practitioners had been informed that they must make NO therapeutic claims on the basis of this study. It was felt that respondents had selectively quoted from guidance about the acceptability to undertake research on children. The Committee accepted the researcher’s view that CFS/ME is different in children and adults and therefore results from research on adults cannot be extrapolated to children. The Committee noted that the intervention was in addition to standard care. The ME association survey data seemed to suggest it is as effective, ineffective or harmful as many other current treatments. Evidence of the risk provided to NRES was anecdotal and of low evidential value, reinforcing the need for such a trial as this one. The Committee were reassured by the fact that AYME had been consulted during the planning of this study. The Committee considered that AYME has been consulted during the planning of this study. The Committee considered this but were satisfied by the processes and precautions in place in the study.. The Committee clarified that this is only a feasibility study and that the primary endpoint is to see if it a full study is possible. The Committee also suggested that the secondary endpoint could be altered to assess the return to the education that children were in prior to their treatment rather than attendance at school. The Committee considered that the researchers accepted that they would not be able to generalise from this to children who had severe ME that kept them at home. It would still provide data on other children with this condition. The Committee was unsure if the ME groups have enough information in the PIS to join. The Committee felt that the PIS should include statistics on the risks of getting worse, whether there was no change, or whether the treatment was helpful. The Committee debated whether, in order to address a possible perceived lack of training of those that might be conducting the Lightning therapy that a practitioner who is subject to a professional code of conduct could be used to deliver the therapy. This was also considered in discussion with the researcher. The Committee also wanted to know if the research has begun recruitment. Q1: Is there anything you would like to say regarding your study? Dr Crawley said that this research had the full support of children and families, indeed the impetus for starting it came from children and families and had the support of AYME. They started recruiting in September and this is well up to schedule. Dr Crawley said that it was a feasibility study and the Committee were content with this. Dr Crawley stated there has been a high recruitment rate so far. Participants have not started receiving treatment yet. Q3: Please explain your recruitment figures and what dropout rate are you expecting? Dr Crawley replied that 96 participants may seem high for a feasibility study this number is smaller than that for some other feasibility studies and reflects both the expectation of up to 50% dropout in one of the arms and a moderate treatment effect (participant numbers reflect the need to ensure there is sufficient data to reliably estimate sample size requirements for the full trial) .Therefore they need high numbers to keep the numbers up to judge across the arms and see why people are dropping out. Q4: Are there differences in the way children and adults are treated? Dr Crawley replied that the treatment approaches are very different in the two groups. There are lots of points of difference but given the outcome is so different between adults and children, adult services tended to focus on symptom management whilst paediatric services aimed for recovery. In addition, paediatric services involved families and dealt with education not work. She added that children are already receiving this treatment and that we need to evaluate it to see if it works. Q5: The practitioner of the lightning therapy has no other allied professional qualifications. The Committee suggested that it might be beneficial to the research if the practitioner had external qualifications other than in Lightning therapy and was covered by a code of conduct? Dr Crawley replied there is a geographical limitation to who can be chosen and that she has worked before with the Bath practitioner who is good. In addition, the children will remain under her care. Prof Gunnell pointed out that children will continue to be under the specialist service in both arms. As the Chief Investigator for the study Dr Crawley accepted responsibility for the activities of the research team and pointed out that in this feasibility study, all Lightning intervention sessions will be recorded and some observed. The Committee requested that the fact that the practitioner is not clinically qualified be added to the PIS. The Committee suggested that consideration should be given to using “clinically qualified” Lightning Practitioners should the feasibility study proceed to a full study in the future. Q6: The risk balance of the study is not included in the PIS. Dr Crawley and Professor Gunnell replied that they would be happy to add this to the PIS. They added that according to the figures in the Parliamentary Inquiry into NHS Service provision for ME/CFS*, Lightning therapy fares better than the standard NHS therapies of Graded Exercise Therapy (GET) and Cognitive Behavioural Therapy (CBT). It was noted that this information related to treatment in adults. Data for children was not available. They also added that when patients get better they also don‟t tend to take part in surveys. The Committee asked for these figures to be added to the PIS and to reference them so they are available but to note that they are relative to adults. Q7: The Committee discussed the secondary endpoint regarding returning to school and suggested that it could be altered to assess the return to the education that they were in prior to their treatment rather than attendance at school. Dr Crawley replied that recruitment and retention is the primary endpoint of the study as it is a feasibility study. She added that the inventory used to measure school attendance also measures home tuition. Those children that are house bound are excluded from the study as they have to be able to get to the clinic. Dr Esther Crawley and Professor Gunnell left the meeting. The committee felt that given current treatment uncertainty research was vital in this area and the proposal is a standard way to assess this. Currently survey data were limited and it was unwise to base health policy on individual case reports. It is vital to see if the lightening process is or is not helpful as children are already receiving this therapy. 1. PIS for Teenagers and PIS for Parents: Please add the fact that the Lightning Practitioner is not clinically (medically) qualified (trained). 3. PIS for Teenagers and PIS for Parents: Add the figures for GET, CBT and the LP from the Parliamentary Inquiry into NHS Service provision for ME/CFS include Data taken from Action for ME (AfME) and Association of Young people with ME (AYME) joint report “M.E. 2008: What progress” and reference it. 4. PIS for Teenagers and PIS for Parents: Add the figures for GET, CBT and the LP from the 2008 MEA survey and reference this. The Committee suggested that for the future Dr Crawley might consider using Lightening [sic] Practitioners who were additionally clinically qualified. The Committee restated the favourable opinion of the application. The Committee nominated Tom Lucas to be the point of contact should further clarification be sought from the applicant. *Ed: Note: The Inquiry into NHS Service provision for ME/CFS was not a “Parliamentary Inquiry”. This was an unofficial inquiry instigated and undertaken by the APPG on ME. The interim report published by the APPG on ME, last year, does not have the authority of either House nor any government agency or department. Yesterday, I wrote to Joan Kirkbride (Head of Operations, England National Research Ethics Service (NRES), National Patient Safety Agency) to ask whether there is a date by which she anticipates contacting those who have written to her in connection with the SMILE Pilot study with an update on the progress of the scrutiny of complaints and concerns. Ms Kirkbride has confirmed to me, today, that she plans to issue a letter this week. I will update when this letter has been received. Because there is no formal procedure through which decisions of Research Ethics Committees can be challenged, this exercise undertaken by the NRES in response to the considerable number of complaints received is not a process open to public scrutiny. “NRES has received the submissions from the ME society [The ME Association] and others concerning the SMILE study, a children’s study investigating treatment of ME in this age group. “Following our Standard Operating Procedures we have collated the information we’ve received and will work with the REC to consider it. “Given that this treatment is currently available, ME society [The ME Association] survey data suggests it has a similar profile to other therapies and the split opinions in the ME community (this study has the support of particular ME charities who have also been involved in its planning) we feel that a fair way forward is to seek the responses of the researchers, sponsor and the ME charities involved in the development of the study before asking the REC to review its favourable opinion. We also note that in this project, subjects will not be deprived of what is current care in this clinic. Research participants will receive this intervention in addition to their standard treatment. Complaints were being passed by Ms Kirkbride to am NRES colleague and to Dr Esther Crawley where permission had been given for communications to be forwarded. The study, which was granted ethics approval by South West 2 REC in September, last year, was expected to start recruiting last September. According to documents obtained under the FOIA, the study funders, The Linbury Trust and The Ashden Trust, had stipulated that the study must begin by October latest. “1. SL asked how the study was going to date. EC replied that recruitment was going well, parents and teenagers appeared to be enthusiastic and there was a higher recruitment rate then envisioned. On 14 July, I submitted a Rapid Response to the BMJ in reply to a response published on 8 March by a Dr Munglani, Consultant in Pain Medicine, West Suffolk Hospital. Dr Munglani had recommended the Lightning Process and given a link to the Lightning Process website in the references at the end of his own Rapid Response to an article about pain management, published in the BMJ in January. BMJ Rapid Responses usually appear within two or three days following submission and when mine failed to appear on the site, I assumed it had been rejected for publication by the Rapid Response Letters Editor. In fact, my letter was published by the BMJ but not until 14 September. Why this letter had been held back over two months isn’t known and an enquiry to the Letters Editor has met with no response. Between late July and early August, the Rowan Centre ceased offering the Lightning Process and all references to the Lightning Process and Lightning Process logos have been removed from their webpage. They now offer their own flavour of the “process”, known as the “BodyMind Programme”. The Rowan Centre also offer their programme for MS patients. “What does it work for? Using the Lightning Process® has proven effective for clearing ALL the debilitating physical and mind based symptoms of ME, chronic fatigue syndrome, and post viral syndrome. “The Phil Parker Lightning ProcessTM is a hugely successful training programme which has transformed the lives of thousands of people whose problems had previously seemed impossible to resolve such as Myalgic Encephalomyelitis (ME), Chronic Fatigue Syndrome (CFS), Post-Viral Fatigue Syndrome (PVFS), Fibromyalgia, Multiple Sclerosis (MS), Obsessive Compulsive Disorder (OCD), Anxiety, Depression and many other debilitating issues. Helen James is a fully qualified Lightning Process Advanced Practitioner, with many years experience in helping people to recover from numerous conditions. For more information about Helen see the About Helen page. Many people that have already used the Lightning Process to recover from the above conditions had previously tried all sorts of alternative healthcare treatments and complementary therapies, but the only treatment that is consistently helping 1500 suffers a year to recover is the Lightning Process. 85% of people that have the attended a Lightning Process training make a full recovery, and the recovery is permanent. .Lyme Disease also known as Borrelia or Borreliosis. Extract from Summary of the ME Association meeting of the Board of Trustees which was held on 15 and 16 November and at which the issue of the controversial Bath/Bristol Lightning Process pilot study in children was discussed. This is a summary of key points to emerge from two routine meetings of The ME Association Board of Trustees. These meetings took place at our Head Office in Buckingham on Monday afternoon, November 15th and on Tuesday morning, November 16th. Informal discussion on some of the topics also occurred on the Monday morning. This is a summary of the two Board meetings – not the official minutes. The order of subjects below is not necessarily in the order that they were discussed. Where appropriate, there is background information relating to the issue being discussed. This statement was sent to the Department of Health with a request that it should be forwarded to the ethics committee that is dealing with the application but the DoH refused to do so. Following a Freedom of Information request we obtained the identify the ethics committee that was dealing with the application and our statement was then forwarded to the Chairman. Unfortunately, due to initial secrecy surrounding the identity of the ethics committee, the information did not reach them till after the application had been approved. A BBC radio discussion from Thursday 11 November about the Lightning Process – which included contributions from Professor Leslie Findley, Dr Charles Shepherd and Phil Parker and was chaired by Anne Diamond – can be heard on YouTube: http://www.meassociation.org.uk/?p=2921. A transcript is also available on the MEA website. The Bath/Bristol press release announcing the pilot study was published on 2 March 2010. The ME Association and The Young ME Sufferers Trust did not issue a joint statement and press release condemning the pilot study until five months later, on 4 August. Under FOI (in a response dated 27 August) I established that the REC responsible for reviewing the application was the South West 2 Research Ethics Committee. This information was provided by Jonathan Cramp, FOI Manager, NHS South West. This information had been requested by me of the University of Bristol on 15 May but was denied in a response of 17 June. It was denied a second time following a request for an Internal Review of the University’s decision to withhold almost all information that had been requested by me under the FOIA. The Internal Review was handled by Sue Paterson, Director of Legal Services and Deputy Secretary, Office of the University Secretary, from whom a response was received on 17 August. Within the response of Jonathan Cramp, FOI Manager, NHS South West, was the information that the application for ethics approval had been received on 14 June 2010 and that South West 2 RE committee had met to consider the application on 08 July 2010. As soon as I had received confirmation of the name of the REC which had (already) reviewed the application, this was passed to the ME Association, who had also been passed all previous communications I had been having with various FOI offices, with various parliamentarians, with the Department of Health and with the South West Regional Manager, National Research Ethics Service. As recorded in the MEA’s meeting summary, above, it was the case that by the time it had been established which RE committee had reviewed the application for ethics approval, the committee had already met six or seven weeks previously (although a favourable opinion was not handed down until mid September since the CI had been asked to revise some content of the patient literature and also address other areas of concern which delayed a decision). When the MEA and TYMES Trust did issue a statement on 4 August, condemning the pilot and calling for the study to be abandoned, this was widely welcomed, as has been the ME Association’s initiative in contacting Trading Standards offices, as is their continued interest in this issue. It remains unclear, though, and of concern to me, why these two patient groups took five months to issue position statements and a joint press release. Forward-ME is a caucus group to the All Party Parliamentary Group on ME (APPG on ME) convened and chaired by the Countess of Mar. The Group were informed that MEA and Tymes Trust had provided a joint statement on the SMILE Trial to Richard Ashby, Chair of the South West ethics Committee, saying that they felt the trial was unethical and that the ethics committee had probably not been made aware that the Advertising Standards Agency had ruled against a claim made by a Lightning Process Practitioner and that trading standards departments had been taking action in relation to misleading therapeutic claims. Concerns about the trial were being assessed by the National Research Ethics Service, headed by Joan Kirkbride. It was said that an increasing number of individuals were contacting ethics bodies to express concerns about the trial. The Group was told of a commentary in the Church Times by Prof Robin Gill, Chair of the BMA Ethics Committee, in which he criticised the research, and that Prof Gill planned to take this up with the BMA. The Chairman had tabled a question asking what the Government’s opinion is on this matter. Christine Harrison asked whether a complaint had been made to the NSPCC regarding the SMILE Trial. Charles Shepherd replied that it had and the content of this could be viewed on the internet. A discussion followed. Concern was expressed regarding the fact that the study involves research being conducted on children before it was tested on adults. It was recognised that the MRC guidelines stated circumstances under which it would be acceptable to perform a study on children in the first instance. The feasibility study would need to prove that these conditions were satisfied in order to achieve ethical clearance of the actual trial. The Principal Investigator would also have to prove that a robust risk management strategy had been developed to minimise any harm to participants. Another concern was that the ethics committee seemed not to have been made aware of the ruling made by the Advertising Standards Agency in relation to claims made by a practitioner of the Lightning Process. The point was made that 250 children a year undergo this treatment and a paediatrician had been approached and asked whether the treatment was safe. However there was a concern that parents who believed they must try everything that might be of benefit to their child could feel pressurised to try the treatment. Children could be very vulnerable to inappropriate pressure to say they felt better. The Group was told that Dr Esther Crawley, the lead for the LP research, had received a large volume of malicious correspondence about her proposals. The Group agreed that this was not an appropriate or acceptable manner in which to demonstrate opposition and confirmed that none of them had been involved. It was suggested that it was activities such as this that drove young researchers from the field. The Chairman suggested that it was important to look at the recovery period covered by the study because M.E. was a relapsing condition. Clinical trials of a training programme for ME, MS, and other conditions raise serious ethical questions, argues Robin Gill. Canon, Prof Robin Gill is a member of the BMA Medical Ethics Committee, has been a member of the Medical Research Council’s Stem Cell Steering Committee, is President of the Society for the Study of Christian Ethics and Chairs the British Sociological Association’s Study Group of Religion. Sir, — On 8 October, you published an article about a feasibility randomised controlled trial investigating interventions for CFS/ME in teenagers — the SMILE study. This article appeared two weeks after all study documentation was made publicly available, and we are disappointed that the author, Professor Robin Gill, made no attempt to contact the study team to verify his assertions before publication, particularly given the nature and strength of the assertions made. We agree with Professor Gill that there is limited evidence on the effectiveness of the Lightning Process in treating CFS/ME. Despite this, approximately 250 children a year pay for and attend Lightning Process interventions. It is precisely for this reason that we listened to children and their families who have asked for improved evidence, and are conducting research that will enable them to make informed decisions about their care. The SMILE project is not “comparing the effectiveness of the Lightning Process with that of conventional medical care”. Participants in this study will receive either specialist medical care or specialist medical care plus the Lightning Process. The purpose of the study is to assess the feasibility of recruitment to a full trial — it is not designed to compare outcomes of care. In this article, Professor Gill argues that children or non-competent adults should be involved only when competent and consenting adults have been fully tested first or where this is impossible, and he quotes from the guidance issued by the Medical Research Council (MRC) and the General Medical Council (GMC). There are, however, other quotations he could have selected, such as the MRC’s lengthy advice about when research into medical care for children is important (pages 7-8) and ethical (page 13), and similar statements from the GMC. Professor Gill ends by stating: “The coercion of children is not an ethically acceptable option.” We absolutely agree with this, and deeply resent the implication that our study involves such coercion. This view was encouraged by the cartoon used to illustrate the article, which we find abhorrent and unacceptable. All the children and families participating in the SMILE study provide fully informed consent/assent by means of a rigorous, recorded procedure that has been reviewed and given a favourable opinion by a research ethics committee. No child is coerced to join the study, and participants can withdraw at any time. The Editor apologises for any offence caused by the cartoon, and for any misrepresentation of the research it might have suggested. 1] The names of all patient organisations who have been involved in the planning/development of the SMILE pilot study. The study will be monitored by a Trial Monitoring Group which will meet every 4 to 6 weeks. The trial Monitoring Group will consist of: Dr Esther Crawley (PI), a member of the BRTC as well as applicants on the grant. An External Advisory Group will also meet: prior to the study starting, by phone conference 6 monthly and at the end of the study. This will be an independent group and will include experts in CFS/ME, including a representative from the Association of Young people with ME (AYME) and the Lightning Process. Please provide the names of all members of the External Advisory Group and the organisations with which they are associated, where applicable. 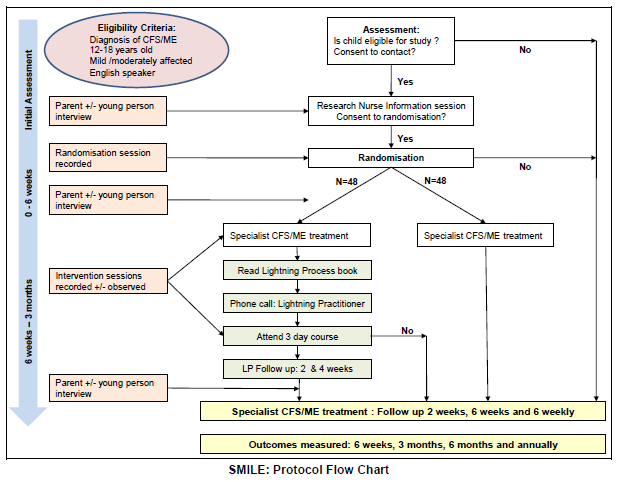 from which I conclude that the only patient organisation involved in the planning/development of the SMILE pilot study has been the Association of Young people with ME (AYME). The membership of the group is included in these minutes. Agenda External Advisory Group: November 2nd 5pm – 6pm. Jenny Ingram (JI), University of Bristol. Everybody introduced themselves. EC outlined the study. SL invited comments on the study documentation. SL said the aims and objectives were clear and it was good to see documentation on the web. This comment was endorsed by other members of the meeting. 1. There was a general discussion about what would happen if either the Lightning Practitioner or the child/family felt that a LP course was not appropriate after discussion. It was agreed that understanding about drop outs was part of the study. 2. There was a discussion that the PIS wasn’t clear on the qualifications or registration of the practitioners. EC agreed and suggested that an amendment was put forward to ethics to add further information on the PIS about this. 3. AW asked whether groups would be feasible given the wide geographical area. EC replied that there were concerns about this but that was why a feasibility study was so important. 4. AW asked why the Chalder trial was not included in the reference list. EC replied that it was published after initial submission to Ethics. 5. JC suggested that the teenager PIS was clearer to read then the adult PIS and could be used for both. EC suggested that the minutes were put on to the website. This was agreed. 1. SL asked how the study was going to date. EC replied that recruitment was going well, parents and teenagers appeared to be enthusiastic and there was a higher recruitment rate then envisioned. [Action] EC to draft response for NRES, show co-applicants and then send to External Advisory Group before submission. On 3 November, I submitted a complaint to Joan Kirkbride, Head of Operations, England, National Research Ethics Service (NRES), in response to the decision of a South West Region Ethics Committee to grant ethics approval to the SMILE pilot study. A response was issued by Ms Kirkbride on 8 November, which can be read at the link above. I am not familiar with the Standard Operating Procedures that NRES works within when dealing with complaints from members of the public in relation to the handing down of favourable opinions following applications to regional ECs or what kind of timeframe scrutiny of, or investigation into complaints might be conducted within. *The “Standard Response” being issued by Ms Kirkbride on behalf of the NRES had stated that it was felt that a fair way forward would be initially “to seek the responses of the researchers, sponsor and the ME charities involved in the development of the study”. I am advised by Ms Kirkbride that NRES are collating a list of all the people/organisations who have contacted them about this study; that they have received considerable correspondence about this matter which will take them some time to consider and take forward but that it is their intention to advise everyone who has written to them about the process and the outcome. So, an open-ended process with no clear procedural timeline. On 11 November, Radio Berkshire presenter, Anne Diamond, interviewed Dr Charles Shepherd, Medical Adviser for the ME Association and Professor Leslie Findley, Clinical Director of the National ME Centre and Centre for Fatigue Syndromes. Towards the end of the item, Duncan McLarty spoke to Phil Parker, founder of the Lightning Process. Within the UK, until 18 November, you can “Listen again” to the Radio Berkshire broadcast here on BBC iPlayer. The item starts 2 hours 3 mins in from the start of programme and is around 12 minutes long. This transcript has been prepared by Suzy Chapman for ME agenda. Care has been taken in the preparation and proofreading of this transcript; some errors and omissions may remain. Anne Diamond: Last week on the show while Esther Rantzen was standing in, we looked at the subject of ME because people diagnosed with the condition are no longer able to give blood. Now we’ve had a huge response from people with experience of the condition and because this is such a controversial area we thought it might be a good idea to get some experts on to the show to deal with some of the points that have been raised. Dr Charles Shepherd is Medical Adviser to the ME Association and Professor Leslie Findley is Clinical Director of the National ME Centre and the Centre for Fatigue Syndromes. I spoke to them both, earlier, and I asked Charles Shepherd just what is ME and are we any closer to knowing what causes it? Dr Charles Shepherd: Well ME stands for “Myalgic Encephalomyelitis” and in very simple terms it’s an illness which often starts with a viral infection and people then have a range of symptoms, primarily muscle symptoms, muscle fatigue and also brain symptoms, problems with memory, concentration, balance, just generally feeling unwell. And these systems – I mean these symptoms – persist for a long period of time in many of these patients; it is a very disabling and has been recognised as a neurological illness. Anne Diamond: Yes. Professor Findley, to be absolutely clear, nowadays there’s no longer any suggestion that it’s a psychological condition, is there? Prof Findley: Erm, no, there’s no suggestion it’s a psychological condition but psychological factors can adversely influence the symptoms and they have to be taken into account when one’s planning a total management strategy for an individual patient. Anne Diamond: Would you agree with that, Dr Shepherd, that nowadays we don’t look upon it as a psychological condition? Dr Charles Shepherd: Well, I thoroughly agree, you know, the Department of Health, the World Health Organisation, classifies this as a neurological illness and you know, like with many chronic disabling illnesses, psychological factors, social factors, can sometimes play a role, that’s not disputed. But it is essentially a neurological illness with other factors involved. Anne Diamond: Now you see, since Esther was talking about this last week we’ve had an email, for instance, which says that all the research and treatment funding then has inappropriately gone to the psychiatric profession since the 1980s. What do you say to that, both of you? Dr Charles Shepherd: Well, to a certain extent well that is true. Certainly in the UK, the vast amount of government funded research has gone in to behavioural and psychological therapies and there has been a great deal of criticism about that. Fortunately, what we now have is the Medical Research Council [MRC] setting up an expert group which I am a member of, to look into research in this illness and we have been for the past two years looking at what needs to be done in the way of biomedical research and a list of priorities in biomedical research has now been sent to the board of the MRC – they are looking at these priorities and we are expecting an announcement very shortly on this. Anne Diamond: Professor Findley, is it true then that we’ve been wasting money – directing the money towards the psychiatric profession? Professor Findley: …and the NICE Guidelines recognise complex and severe Chronic Fatigue Syndrome/ME to emphasise the complexity of this, this, this illness, it is not a simple entity it’s not like some tuberculosis where you have a defined marker and a defined organism and a defined treatment. Anne Diamond: So and Dr Shepherd, you would agree that this a range of different conditions? Dr Charles Shepherd: Yes, and I mean this is another key point, that we have renamed and redefined this illness from ME into what’s now called “Chronic Fatigue Syndrome”, the term that the medical profession tends to use and unfortunately this has now produced, it’s rather like dumping everyone with different types of arthritis, inflammatory arthritis, osteoarthritis, infective arthritis, under one umbrella and saying that they’ve all got the same cause, the same symptoms and the same treatments and that does not apply to arthritis, it does not apply to everyone who comes under this umbrella of Chronic Fatigue/Chronic Fatigue Syndrome. This is one of the key points the MRC is addressing the need for sub grouping people under this umbrella, finding the different causative factors that are going on and then applying appropriate different forms of management to the different types of sub groups under this umbrella. Anne Diamond: Now, I mean, you look at the situation – for instance here in Berkshire – where our Primary Care Trusts [PCTs] are offering Cognitive Behavioural Therapy [CBT]. Is that appropriate any longer? Dr Charles Shepherd: It’s not appropriate as a one size fits all treatment and this is our big problem with the NICE Guideline, it’s why patients object to the NICE Guideline because the NICE Guideline recommends CBT and Graded Exercise Therapy [GET] should be offered to everyone with mild to moderate ME and this is not what we feel is appropriate one size fits all treatment. Many patients find these therapies either ineffective, around about 50% with CBT and in the case of Graded Exercise treatment, if you apply this wrongly you make these patients worse. That’s why there is terrific concern and anger amongst the patient community with the NICE Guideline. Professor Findley: Erm, that’s a very straightforward question with a very complex answer. I think the Lightning Process has a part to play in the management of some patients. It is not a specific treatment for Chronic Fatigue Syndrome/ME, it’s used to treat a whole raft of conditions. But there are some patients that can be recognised who have factors which would lend themselves – factors which are perpetuating the illness – which would lend themselves to the Lightning Process. Now these are, in my opinion, a very small group of patients overall, but because Lightning Process practitioners are often only experienced in that one technique they apply it to anybody who visits them with an objective of getting treatment, so their patients are treated in an unselected manner and therefore this has led to all sorts of complications and dissatisfaction. Dr Charles Shepherd: Well, I have this strong objection to the Lightning Process – in particular the way it’s marketed to very vulnerable groups of people with adverts which are making unsubstantiated claims about success rates. Anne Diamond: But it clearly is true for some and as you both seem to be agreeing that this is multi-factorial, very complex, no one patient is exactly the same as the other. Professor Findley: Well I think I absolutely agree with this, but erm… the…and I agree with Charles’ comments on the Lightning Process – it’s been badly, badly applied, poorly researched and we would use it or recommend it probably in perhaps one in thirty or one in forty of patients, after they have been properly assessed over a long period of time and more standard management programmes have been applied. Anne Diamond: Before we run out of time, can I finally ask both of you really ‘cos a lot of people who contacted us were asking about recovery rates from ME. What can you tell us about the numbers and are indeed there any robust figures on this? Dr Shepherd, first. Dr Charles Shepherd: Well, I wouldn’t say there were really robust figures. I think its, a lot of it is clinical judgement from individuals, you know, that see patients with this and you know, a limited amount of epidemiological research. Where I come in is I think we probably have three groups. We have a group at one end of the spectrum who are severely effected certainly at some stage in their illness and they probably account for about 25% of the total, I mean these are people who are bed-bound, wheelchair-bound, house-bound. We have a large group in the middle who make some degree of, I think the word here is improvement, over the course of time but do not recover but they hit a glass ceiling, 50, 60, 70% of what they were normally like and then we have a small group at the other end of the spectrum who make a much more significant degree of improvement or may even finally recover – an example there is Yvette Cooper, a former government minister. I would add that the improvement/prognosis in children/adolescents with this disease does seem to be a lot better than it is in adults. Anne Diamond: And Professor Findley? Professor Findley: I would, there aren’t robust figures and I think Charles is right, we would normally say that the average duration taken across the group, the average duration of this type of illness is three to five years with at least 40% of patients never getting back to previous levels of functioning and I’d agree with Charles there is the very severe group and their prognosis is appalling and they very rarely get any proper management advice. Anne Diamond: Well that was Dr Charles Shepherd and Professor Leslie Findley speaking to me a little earlier on. It’s a very important subject isn’t it? It’s very important that we hear a balanced argument on it. So we put some of those issues to the founder of the Lightning Process, Phil Parker. Phil’s website calls the process “A non medical tool that is tailored to help people who are stuck in their life or health”. Well BBC Radio Berkshire’s Duncan McLarty, first asked him whether he agreed that the process is only appropriate in a small fraction of ME cases. Phil Parker: You know that sounds like scientific data but it’s not science – there’s no evidence to say that, that’s just their opinion! First thing we do is have a chat with people and we assess them as to whether this is a really useful thing for them because obviously we want to see people who we think are going to get value from this. Duncan McLarty: But if you’re not an ME specialist how would you know if it’s appropriate? Phil Parker: Er, well we are specialists at the Lightning Process. We know more about the Lightning Process than these people because we designed it and trained in it. So what we are looking for is, do we think these people are likely to get benefit from the stuff that we do. What we’re really interested in is how can we help these people who, who’ve got stuck, where there aren’t many solutions, is there anything we can do to help them that’s really where we’re coming from. Anne Diamond: Well can I just say thank you very much for all your emails on the subject of ME over the last week or so. I think we’ve certainly shown that it’s a complex area with plenty of strong and sometimes conflicting views. We also asked Phil Parker whether he agreed that the process was aggressively marketed as those two experts told me. Phil Parker: Basically our practitioners, erm, don’t make claims. What they say is, that you know our experience is, that when some people use this they can make changes. That doesn’t guarantee change. If you…you know you have a business then you want to tell people about it that doesn’t make it aggressive marketing, that’s the thing I… deny and say that all we’re doing is, say look this is something that we’ve found is very useful, have a look at it and if you want to talk to us more about it then do, if you don’t that’s fine as well. We really don’t market it aggressively at all. Anne Diamond: Well there you are, you see, that was Phil Parker, who is the founder of the Lightning Process, and earlier on I was talking to Dr Charles Shepherd, Medical Adviser to the ME Association, and Professor Leslie Findley who’s Clinical Director of the National ME Centre and the Centre for Fatigue Syndromes. Note: This is an edited version of content first posted on 11 November. On 2 November, the ME Association reported that BBC Radio Berkshire had broadcast an interview with the ME Association’s medical adviser, Dr Charles Shepherd, during an item on the UK life ban on blood donation by everyone with the illness ME and CFS which was implemented on 1 November. During the interview, also broadcast on 1 November, Esther Rantzen, standing in for Anne Diamond, the usual presenter of this mid-morning programme, had sidelined discussion of the implementation of the blood ban to promote the Lightning Process. There has been considerable concern about the way in which Ms Rantzen conducted herself during the ME strand on this programme which had included contributions from ME patients via phone link. Complaints have been pouring in to the programme producers by email and phone. WRONG. The lifetime blood ban from the 1st November applies to everyone who has been given a diagnosis of ME or CFS in the UK. Esther announced that the ban “cannot apply” to individual cases. That is very irresponsible of her and appears to overrule the Blood Services announcement on the ban. Esther has directed the caller to look up Lightning on the internet for the second time in a few minutes. What Will would find on the internet is the commercial Lightning site advertising Lightning. WRONG. There is no equivalent of Lightning on the NHS. Today, just after 12 noon, in a pre-recorded interview, Anne Diamond discussed ME and CFS in general, its WHO neurological classification, the need for biomedical research and sub-grouping, the MRC’s CFS/ME Expert Group, the Lightning Process, and illness prognosis with Dr Charles Shepherd and Professor Leslie Findley. There was a brief contribution from Phil Parker towards the end of the interviews. In 2007, Prof Leslie Findley had undertaken an informal, non RCT pilot study of the Lightning Process. No results from this pilot have been published but Prof Findley spoke to the Canadian media in an article here, in 2008, in which he quotes unremarkable results and reports that in small number of cases there can be bad relapses. An personal account here on Bad Science Forum mentions Prof Findley’s involvement in “Neuro Behavioural Training” – an approach described as encompassing “Occupational Therapy, Clincal Hypnotherapy, Neuro Linguistic Programming, Cognitive Behaviour Therapy and Life Coaching”. Sessions take place over three days. When asked about the Lightning Process, in today’s interview, Prof Findley said “…it’s been badly, badly applied, poorly researched and we would use it or recommend it probably in perhaps one in thirty or one in forty of patients, after they have been properly assessed over a long period of time and more standard management programmes have been applied” but he did not mention that he had, himself, undertaken an informal pilot in 2007. Starts at 2 hours 3 mins in from beginning of programme. I am writing to complain about Ms Rantzen’s handling of this broadcast. I understand that Ms Rantzen was standing in for the usual presenter, Ms Anne Diamond. 1] Ms Rantzen was brought in to present a programme during which the ME/CFS blood ban would be discussed. Ms Rantzen has a number of COIs in relation to ME/CFS. Ms Rantzen is President of AYME (The Young People’s ME Trust). She is known to promote the Phil Parker Lightning Process in the media. The patient organisation of which she is President has for its medical adviser, Dr Esther Crawley. Dr Esther Crawley is about to commence recruiting participants to a controversial pilot study where the Lightning Process will be applied to children aged 12 to 18 years old, for which Dr Crawley is Chief Investigator. The patient organisation of which Ms Rantzen is President has been involved in the development and planning of this Lightning Process pilot study. The patient organisation of which Ms Rantzen is President has a seat on the “Expert Advisory Group” for this Lightning Process pilot study. 2] I have scrutinised a partial transcript and note that during the broadcast, Ms Rantzen, on several occasions, sought to promote the Lightning Process to the public and to a contributor to the programme calling on a phone-link and that she also directed him to look at the internet for more information on the Lightning Process. Ms Rantzen also made claims for recovery rates of patients with ME/CFS for which she offered no supporting evidence. 3] In my opinion, Ms Rantzen gave misleading information in relation to the blood ban and its application to individuals. In response to the caller’s concerns about the cost of the Lightning Process, Ms Rantzen is reported as having said, “I think there may be an equivalent on the NHS”. This is incorrect, there is no equivalent available on the NHS. In the light of Ms Rantzen’s COIs and given her blatant promotion of the Lightning Process during a BBC broadcast I do not consider that Ms Rantzen could be considered to have been a neutral presenter. I do not consider that she should have used the issue of the ME/CFS blood ban to promote a commercial “training” programme marketed by Phil Parker and his Lightning Process trainers / coaches / practitioners during a BBC broadcast. I consider that the BBC was negligent in its failure to take Ms Rantzen’s COIs into consideration when selecting a stand-in for Ms Diamond and that Ms Rantzen had taken advantage of her position, as presenter, to introduce and promote the Lightning Process to the public during an item, the focus of which, was the recent UK blood ban for ME/CFS patients. I would welcome your responses. I also request a copy of the BBC’s policy on the declaration of COIs in its presenters and a copy of the BBC’s policy on the promotion of commercial goods and services by BBC presenters during broadcasts.